To commemorate the 50th Anniversary of The Canadian Numismatic Association, the following souvenir items are offered for sale. All prices in Canadian funds. 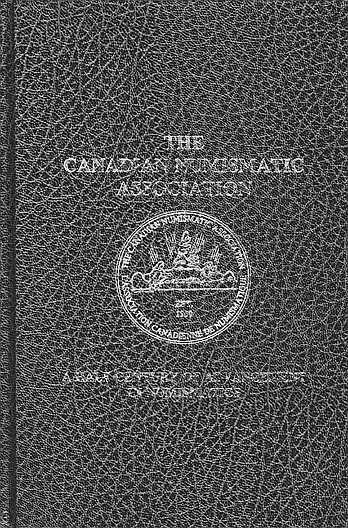 The Canadian Numismatic Association - A Half Century of Advancement in Numismatics, written by C.N.A. 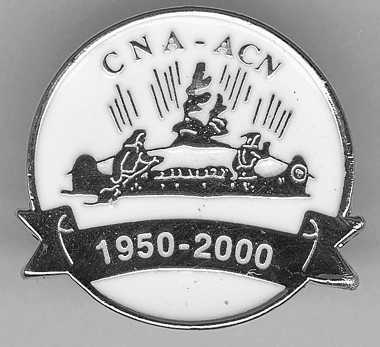 Archivist Stanley Clute, traces the history of the C.N.A from the events leading up to its inception in 1950 through to 2000. A hard covered, nine by six inch, 148-page book, is not only chock full of widely known facts, but covers much little known and/or unpublished material and includes an abundance of photos, some of which have not been seen before. The cost of the book is $18 including postage and handling. The cost for five or more books is $15 each, including postage and handling (outside Canada please add $2). The Golden Anniversary Souvenir Medallion is 38 mm antiqued gold finish, featuring on the obverse the C.N.A. 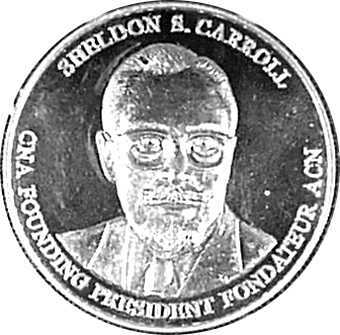 Golden Anniversary logo, designed by Diane Levesque, and on the reverse the likeness of Sheldon S. Carroll, founding President of the C.N.A. Total mintage: 250 medallions. Cost: $10 each, incl. postage if applicable. The Golden Anniversary Scrip features, on the front, the Golden Anniversary logo on the left and the likeness of Sheldon Carroll on the right. On the back are the names of the current and past presidents of the C.N.A. and its long serving executive secretary, along with each of their years of service in their respective capacities. Total printing 250 notes. Cost: $5 each incl. postage if applicable. The Golden Anniversary Commemorative Pin features a modified Anniversary logo, with gold lettering on a white background. Total manufactured 250. Cost: $5 each including postage if applicable.